Our tasting fee is $10 is refunded or waived with a $30 wine purchase. 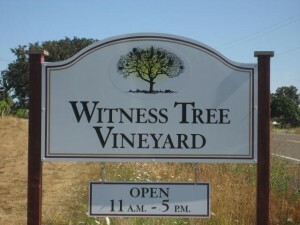 Tasting fees are waived for Wine Club members. We kindly ask that parties of eight or more please call ahead to arrange your visit. You have a choice: you can take the scenic route through farm country and cross the river on the ferry (see directions below), or take Highway I5 south to the Salem Parkway Exit. Stay on the Salem Parkway to the center of town (about 5 miles); eventually it becomes Commercial Street. Stay in the center right lane on Commercial Street and watch for a right turn to cross the Marion Street Bridge over the Willamette River into West Salem. Stay to the right crossing the bridge, following signs to Wallace Road (Highway 221). Turn right (north) onto Spring Valley Rd. Continue north 1.5 miles looking to the left for the burgandy windjammers waving in the wind. Head South on Highway 99W. Go through Amity, observing the speed limit. Continue South 5 miles past Amity. At the blinking traffic light turn left onto Bethel Road. Go 6.5 miles on Bethel Road (which magically becomes Zena Rd. Turn left (north) onto Spring Valley Rd. Continue north 1.5 miles looking to the left for the burgandy windjammers waving in the wind. Take I-5 to Salem Exit #253, which takes you onto Highway 22. Follow Highway 22 to the center of town and onto the Marion Street Bridge, crossing the Willamette River into West Salem. Once you are on the Bridge DO NOT follow Highway 22 any further. Instead, stay to the far right crossing the bridge, following signs to Highway 221 towards Dayton. Turn right (north) onto Spring Valley Rd. Continue north 1.5 miles looking to the left for the burgandy windjammers waving in the wind. Drive North on Hwy. 99W about 10 miles past Rickreall. Turn right at the McCoy-Lincoln Junction, marked by a blinking traffic light, onto Bethel Road (named Zena Road at its other end). Go 5.6 miles on Bethel Road (which magically turns into Zena Rd) and turn left (north) onto Spring Valley Rd. Continue north 1.5 miles looking to the left for the burgandy windjammers waving in the wind. It is recommended that you call the Ferry in advance to ensure they are in operating. Telephone number for the Ferry is (503) 588-7979. Directions: Going south from Portland on I-5, take Donald/Aurora Exit #278, turning right onto Ehlen Road. Continue straight ahead east for a total of 5 miles (along the way Ehlen Road becomes Yergen Road, then Yergen Road becomes McKay Road), then turn left onto French Prairie Road. Landmark at the intersection of McKay Road and French Prairie Road is Fergusen’s Fragrant Nursery on the right – nice demonstration gardens, worth a stop! Go south on French Prairie Road a total of 10 miles. The essential thing to remember is that, for these 10 miles, whenever you are confronted with a choice, go straight ahead. In particular: after 2.1 miles there is a stop sign where French Prairie Road becomes Highway 219. Go straight ahead south. After another 2.8 miles there is another stop sign where French Prairie/219 becomes River Road. Do not turn; go straight ahead south 5.3 miles further, then turn right on Matheny Road. (Matheny Road is just past Concomly Road; if you get to Waconda Road you have gone too far.) Go 3 miles on Matheny Road, through the hop fields with their towering trellis system – a sight to behold in the growing season, then turn right onto Wheatland Road and follow it to the ferry landing. After you cross the river, go straight ahead on Wheatland Road about a mile, then turn left on Wallace Road (Highway 221). Go 2.8 miles on Wallace Road, perhaps stopping at Daum’s produce stand for whatever is in season (sorry, Daum’s is no longer open), then turn right onto Hopewell Road and immediately left onto Spring Valley Road. 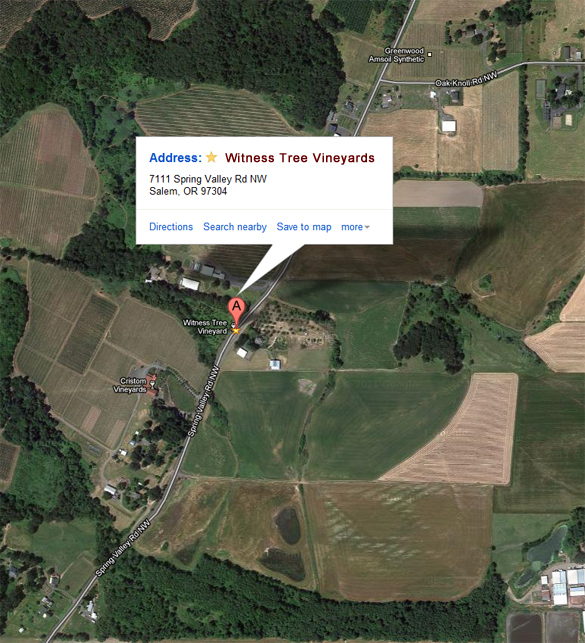 Go approximately 3 miles on Spring Valley Road to our winery which is located on your right. Welcome!